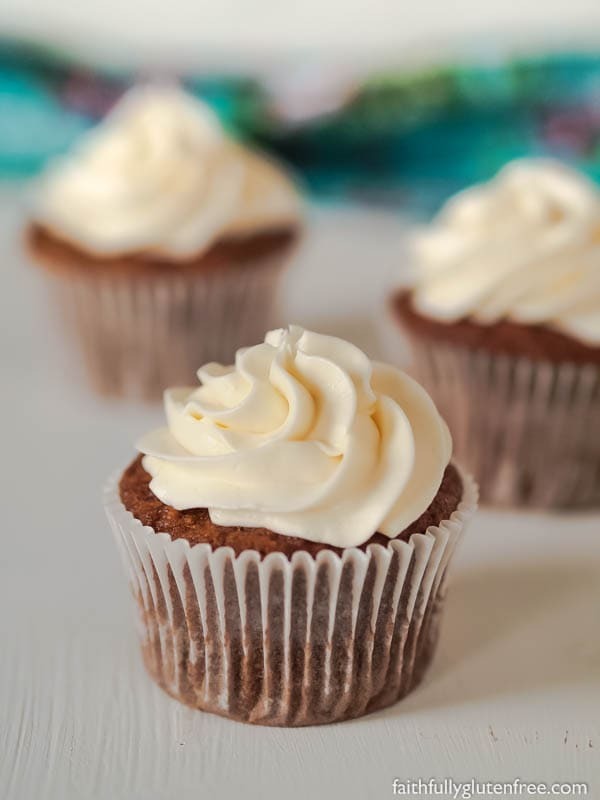 These Gluten Free Carrot Cake Cupcakes are loaded with shredded carrots and warming cinnamon. 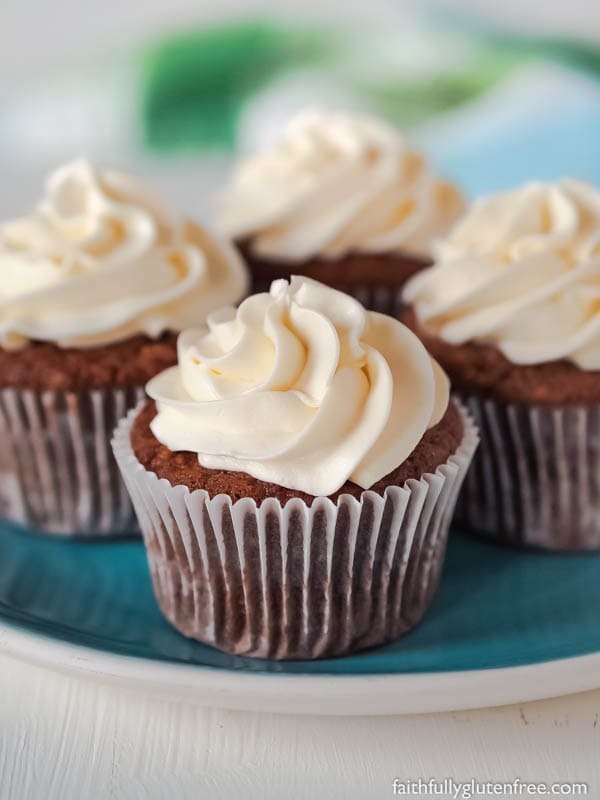 Topped with the lightest cream cheese frosting, you are going to love them! 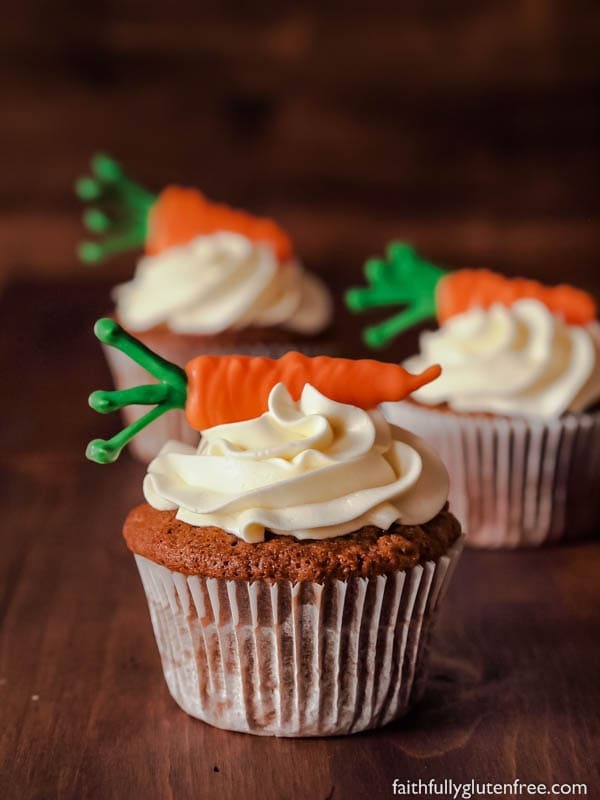 Help me out here, are Carrot Cake Cupcakes a spring dessert, when we have Easter, or a fall dessert, when we harvest carrots? I think they are perfectly suited for an Easter dessert, but honestly, I’d eat them any time of year. To decorate these gluten free Carrot Cake Cupcakes for Easter, I melted some coloured chocolate wafers in zipper seal bags, cut the tip off, and piped little carrots onto wax paper. Once they cooled, they can be picked up, and placed on top of your frosted cupcakes. Not necessary, but really, really cute, don’t you think? 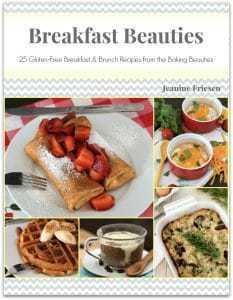 This recipe is based on a gluten free Carrot Cake recipe that I have been using for years. To make things easier, I’ve now baked it in cupcake form. Cupcakes are cute – individual serving size, you can eat them with your hands, a higher frosting to cake ratio – what’s not to love? Preheat the oven to 350 degrees F. Line muffin tins with paper liners, or lightly grease. Set aside. In a large bowl, whisk together the brown rice flour, sorghum flour, tapioca starch, dry milk powder, cinnamon, baking powder, baking soda, xanthan gum, salt, and nutmeg. In another bowl, whisk together the granulated sugar, oil, brown sugar, apple sauce, eggs, and vanilla extract. Pour the wet ingredients into the dry ingredients, and stir to combine.Fold in the shredded carrots, and spoon into prepared muffin tins. Bake in preheated oven for 25-30 minutes, or until a toothpick inserted into the middle of a cupcake comes out clean. Remove to wire cooling rack, and cool completely before frosting. Beat together the confectioners' sugar, cream cheese, butter, and vanilla until smooth. Pipe on top of the cooled carrot cake muffins. I used a 1M Wilton piping tip to get the swirls. Refrigerate the cupcakes until ready to serve. 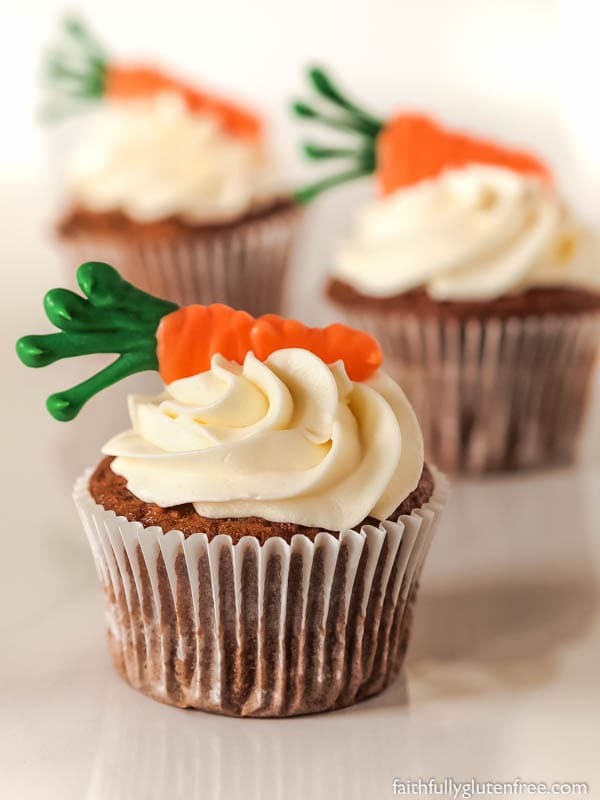 These look great and I think I will make them for Easter, complete with the lil’ candy carrots on top! I need to leave the milk powder out of the recipe. What would be a good replacement for that? Thanks for the great -sounding recipe! Thanks, Jeanne! Omit it, you should be fine! I was told the colored wafers are not gluten fee by Wiltons and the bulk food store. Which ones do you use that are GF. From my understanding, the Wilton ones contain no gluten, nor do they have a “may contain” statement, so I use those. Ingredients: SUGAR, PARTIALLY HYDROGENATED PALM KERNEL OIL, REDUCED MINERAL WHEY POWDER, WHOLE MILK SOLIDS, NONFAT DRY MILK SOLIDS, SOY LECITHIN, SALT, ARTIFICIAL FLAVOR. I’m anxious to try these, Jeanine! I’ll have to change them a little, since our daughter can no longer eat rice. We’ll work it out. Thanks for the recipe. They look beautiful!! Why do my gluten free cupcakes shrink once they have cooled? They look so small next to a box cake mix cupcake !